Using a non chemical method to calm your waves and curls will keep your hair healthy. 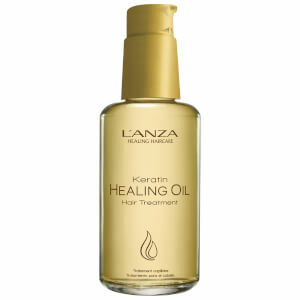 L’Anza Healing Smooth Smoother Straightening Balm blocks humidity and stops frizz whilst helping to maintain a healthy internal moisture level. This lightweight Smoother Straightening Balm, which reduces drying time and is part of L’Anza’s Healing Smooth range, boasts moisturising shea butter and shine enhancing mangosteen. It adds a wonderful glossy sheen to your hair as it helps to straighten out curls and waves. Blow dry with a brush for smoothness. Water/Eau (Aqua), Stearalkonium Chloride, Hydroxethylcellulose, Amodimethicone, Octoxynol-40, Isolaureth-6, Propylene Glycol, Keratin Amino Acids, Hydrolyzed Coix Lacryma-JOBI Ma-Yuen Seed Extract, Garcina Mangostana (Mangosteen) Fruit Extract, Butyrospermum Parkii (Shea Butter) Extract, Onothera Biennis (Evening Primrose) Oil, Cereus Grandiflorus (Cactus) Flower Extract, Sodium PCA, Magnesium PCA, Zinc PCA, Manganese PCA, Dimethicone PEG-8 Meadowfoamate, Panthenol, Cetareth-5, Methyl Gluceth-20, Silicone Quaternium-3, Trideceth-7, Trideceth-12, Tris (Tetramethylhydroxpiperidinol) Citrate, Magnesium Sulfate, Methylparaben, Propylparaben, Fragrance (Parfum), Benzyl Benzoate, Benzyl Salicylate, Sodium Benzotriazolyl Butylphenol Sulfonate, Buteth-3, Tributyl Citrate Yellow 5 (CI-19140), Red 40 (C-16035), Limonene, Linalool, Amyl Cinnamal, Hexyl Cinnamal, Butylphenyl Methylpropional.